The “Linsanity” mania is still fresh in the Mecca of Basketball as Jeremy Lin continues to impress with the New York Knicks and it was a fitting way to give attention to the new Knicks-themed Air Jordan 4 that was recently unveiled. 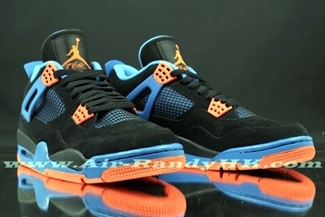 The Air Jordan 4 “Knicks” looks very impressive in general with its Black suede on the upper part accented with touches of the Knicks’ blue and orange color, making it look like a pair for New York’s away color in the NBA. No official release date has been announced but this one is expected to come out very soon so watch out for it!